The article describes the 2013 CIFE awards ceremony at the House of Lords, and outlines the individual award winners' achievements. 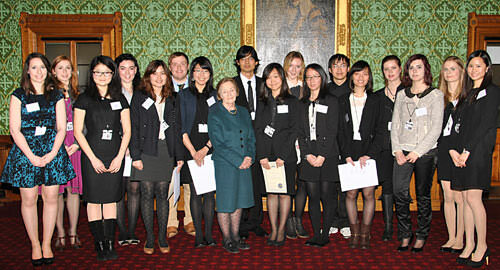 At the annual CIFE Academic Awards Presentation held at the House of Lords on Monday 18th March 2013, Baroness Perry of Southwark presented CIFE awards to thirty eight CIFE college students. 19 students received CIFE Academic Awards for outstanding A-level results, one for GCSE and one for Foundation courses. Competition for Awards is fierce: perfect module scores and national ranking exam performance are usually needed! 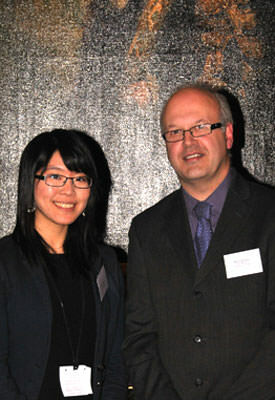 It's truly outstanding CIFE college students win awards. Another 18 students whose all-round contribution to the life of their college life has been exceptional received CIFE College Awards. Onusa is pictured with CIFE Chairman Mario Di Clemente. Baroness Perry, former Chief Inspector of Schools, is the President of CIFE. Lady Perry is a staunch supporter of British universities for their work with young people and for their research. In the Teaching Excellence debate in 2010, Baroness Perry praised the excellent work of teachers. CIFE Colleges were all delighted by Baroness Perry’s statement that, “An inspirational teacher can literally change lives. At its best, teaching is a magic process that lights up the imagination of young people, draws out their curiosity and gives them lifelong skills and understanding.” The award winners here today are signal proof of the truth of these words and CIFE Colleges will endeavour to continue to change lives! The 2013 CIFE Award winners are pictured above with Baroness Perry.